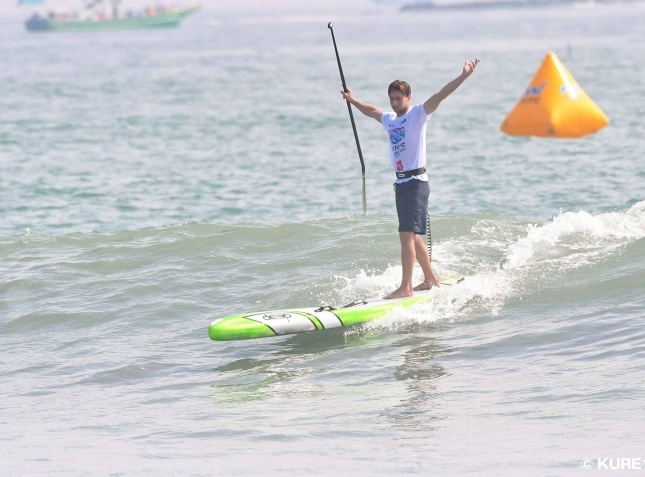 Meanwhile Lincoln, up against half a dozen all-star internationals and plenty of dark horse locals, cemented his favouritism for next month’s season-ending showdown in California after decisively claiming both days. 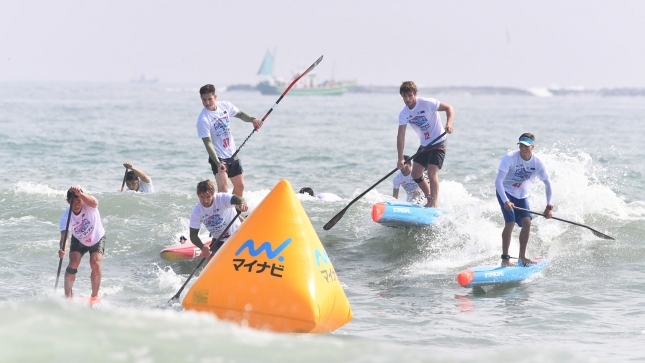 The weekend was highlighted by a massive showing in the open races, with over 300 paddlers taking part in this year’s Japan Cup despite the intimidating ocean conditions to show why Japan is considered the most passionate stand up paddling community in the world. Saturday’s distance race, billed as an 18k’er but unexpectedly shortened at the last-minute to 10km (6 miles), became something of a middle-distance sprint, with a tight field and fast pace ensuring the whole thing was done in under an hour. Despite heavy checking from home-nation hero Kenny Kaneko and 11 Cities runner-up Daniel Hasulyo, Lincoln managed to pull clear and snag the win for Team DEEP, while Fiona managed a similar feat in the women’s. 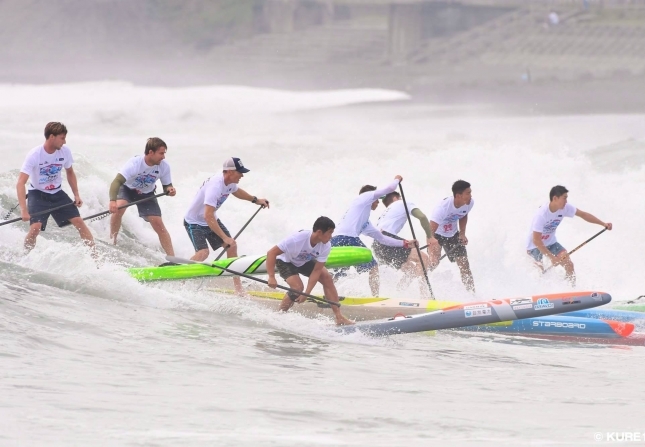 Sunday’s main event certainly lived up to its billing, with the “Survivor” format once again proving to be one of the most exciting types of racing in the world of paddling. With a typhoon swell fast increasing and a short, sharp course filled with some of the best surf-racing athletes on the planet, the spectacle was both mildly chaotic and utterly entertaining. The weekend was dominated by the Aussies, at least on the men’s side, with five of the top six Survivor finishers flying the green & gold. They all hail from Queensland, a region famous for its surf racing pedigree stretching back decades into the old lifeguard-racing days. Apart from Lincoln, Sunova’s James Casey was on fire with a runner-up finish, while the relatively-unknown Tim Cyprien finished an overall fourth to show just how ridiculously deep the Aussie talent pool runs. Other notable finishers included Matt Nottage (5th overall) and veteran Kelly Margetts (7th). The only non-Aussie who got into the mix on Sunday was Hungary’s Daniel Hasulyo, who shook off the effects of his 220km marathon in the Netherlands to claim third place in the Survivor and second place overall. Some new names to impress in Chigasaki included the future Japanese number one, Rai Taguchi, who at just 14 years of age is already snapping at the heels of Kenny Kaneko, as well as fellow-youngster junior Jack Seymour who stole a top 10 overall spot ahead of many seasoned competitors. Rai has had a couple of solid results on the international scene already, however his progression over the past 18 months has been meteoric. 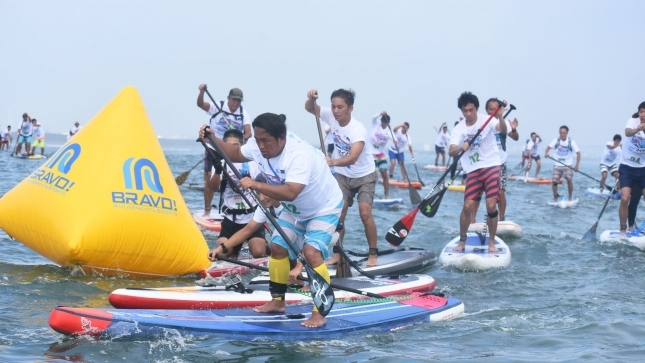 The Okinawa-based athlete jumps +9 places to now find himself sitting top 40 on The Paddle League World Rankings. Meanwhile Jack, whose family hails from South Africa but is based in Hong Kong, has jumped a massive 23 spots to sit #73 in the world as we draw towards the end of Season 2018. Jack also scores a spot on Team Naish in the updated VMG ‘BATTLE OF THE BRANDS’ standings, however the yellow boys from Maui (and pretty much every other brand) are being dwarfed by the all-conquering Starboard Dream Team, who now hold a ridiculous 1500.00 points — to highlight the Tiki team’s dominance, even a virtual Starboard B Team would still be ahead of every other brand. But perhaps the biggest newcomer this year was Rika Okuaki, who snapped up a second-place finish in the Survivor to claim the overall runner-up spot ahead of her highly-fancied compatriot Yuka Sato. Rika hails from Zamami – home to The Paddle League’s other stop in Japan – where she helps lead the island’s amazing junior training program. But the Survivor will probably be remembered for the freak injury suffered by Angie Jackson. The Australian was already having a rough weekend after fainting and then retiring early on in the 10K race, but her Chigasaki campaign quickly went south on Sunday. 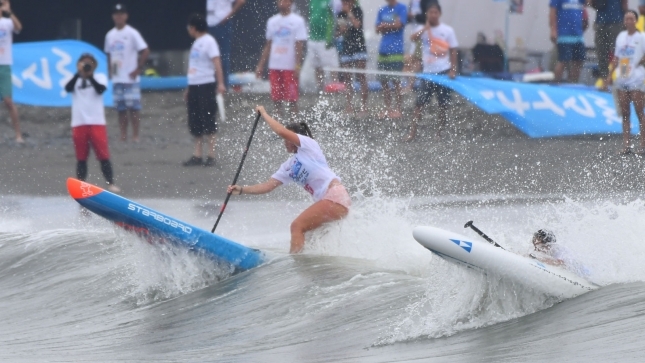 Sitting in the virtual runner-up position as she surfed in for the final leg of the Survivor, Angie’s board smashed her ankle in the shorebreak and left her unable to even reach the finish line. 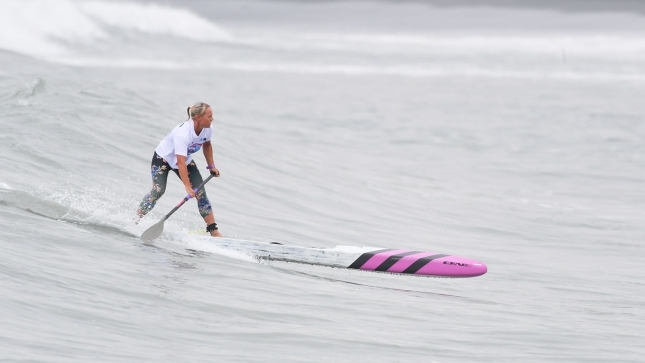 The damage soon became apparent after a trip to the hospital: Ruptured Achilles – the ligament was torn clean off the bone – and a fractured heel bone that will see her miss three months of paddling. 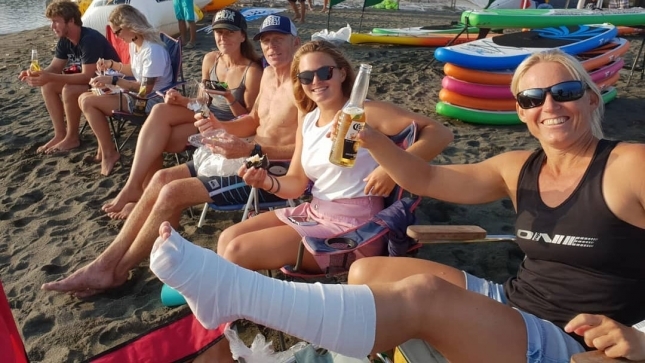 Though in true “Aussie battler” fashion, Angie was seen drinking a beer on the beach Sunday afternoon, while the ONE team rider is already plotting her competitive comeback at next April’s Carolina Cup after a successful surgery at home in Australia today. Here are the full results from this 4-star Paddle League regional event; big thank you to the organisers and everyone involved in this great weekend (and a special shout-out to @kure134 for all the great action shots). 31 Dion Vincent 31 DNS 1.52 . 49 Sung Ho Han DNS 25 0.44 . 50 Chaulong Lekhac 46 DNS 0.40 . 5 Miu Kogai 5 4 17.00 Japan . 6 Natsuki Sakai 6 DNS 14.00 Japan .